Here we have a crafty way to recycle your old surfboard, ideal for the city dweller looking to save some space! This DIY surfboard table how-to is courtesy of Adlin Deliz, York Surf jewelry designer. 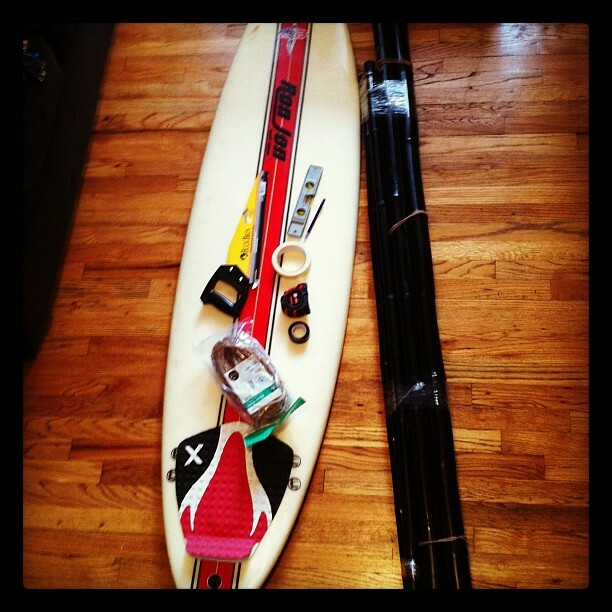 Her board is a 6'6 x 19, so change your measurements accordingly. Bamboo - depends on the length of your surfboard but I needed two 2" x 6' pieces and three 1.5" x 5' pieces. Make the calculations according to the size of your board. Long screws with washers & nuts - 8 of each. The length of the screws are determined by the thickness of the legs and support beams added together so take the measurements to the hardware store for the exact fit. Take the 2" x 6' bamboo and mark it at 29" and cut. You will cut four of these for the legs. Make sure the cuts are level. Be careful not to split the bamboo when cutting. For the top cross-supports (where the board will rest on) cut the 1.5" x 5' bamboo at the thickness of the width of the middle of your board. The other two 1.5" x 5' pieces are kept in tact for the bottom supports. Tip: Measure twice, cut once! Now that all the pieces are cut you will need to put it all together. Take the bamboo legs about 2" from the top, mark and drill a hole on each side for the screws. Repeat for all three additional legs. Next, take the 19" cross-supports and mark and drill holes so they align with the holes from the legs. Do the same with the other cross- support. This is where you will rest the board which will be your tabletop (face down or up, depending upon the rocker or if you have a track pad on the top of your board). For the bottom supports, measure about half way down each table leg and drill holes on both sides from theinside of the legs. 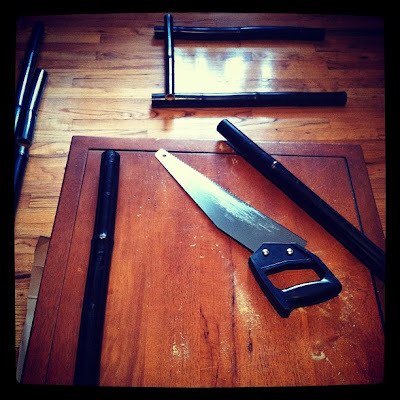 Take the long 1.5" x 5' pieces and drill holes on both ends to align with the leg holes. Repeat with the other piece. Once all the holes have been drilled, take your long screws, washers and nuts and put everything together - not too tight, to avoid splitting the bamboo! 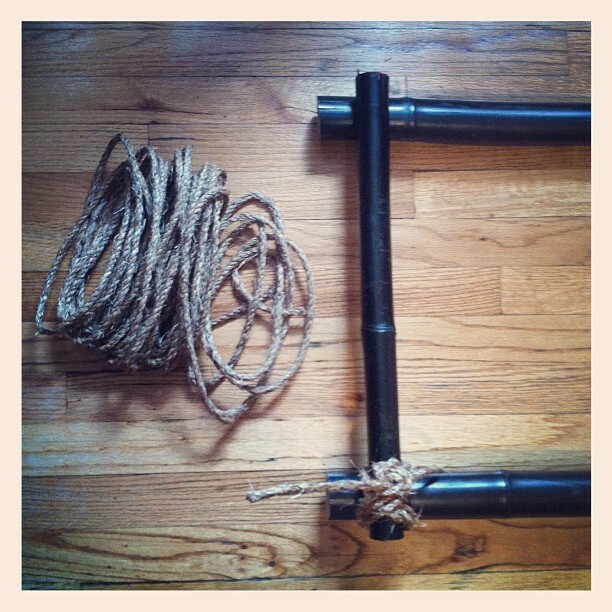 Personalize with paint or by adding manilla rope to the edges. 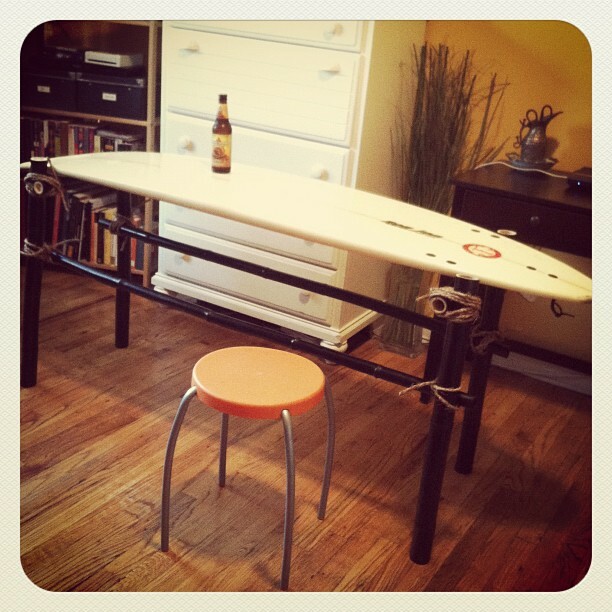 Sip a cold brew at your new surfboard table! Another way to give old surfboards a new life is by donating to a non-profit like the ReSurf Project, which refurbishes old boards and uses them to teach underprivileged youth around the world.